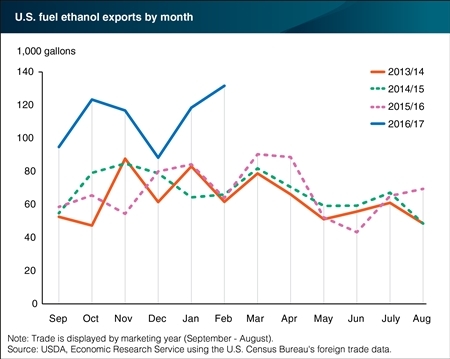 U.S. fuel ethanol exports are up significantly for the 2016/17 marketing year, primarily driven by increased exports to Brazil. The change is related to an increase in Brazil's sugar prices, which is due to strong international demand for the country's sugar exports. As a result, the country's sugarcane refiners have shifted processing capacity from ethanol to sugar. Since Brazil has a 27-percent ethanol inclusion mandate for gasoline, the decline in output has left fuel refiners short of supplies. This has caused an increase in ethanol shipments from the United States, where corn supply is abundant, making up for Brazil's shortfall. U.S. ethanol shipments to Brazil began rising in October 2016, jumping 138 percent that month. The pace has continued at an elevated level through February 2017, the latest month for which trade data are available. From October 2016 through February 2017, fuel ethanol shipments to Brazil surged 547 percent, compared with the same period a year earlier. In addition, U.S. shipments to the world rose 65 percent and exports to Canada, also a major buyer, rose by 57 percent. This chart appears in the ERS Feed Outlook report released in April 2017.